My visit to Trnava was on the train ride back to Bratislava after visiting Trenčín. Located just thirty minutes away from Bratislava, Trnava (ter-NAH-va) was touted by the Slovakian tourism center as a nice excursion from the capital and not too far away. 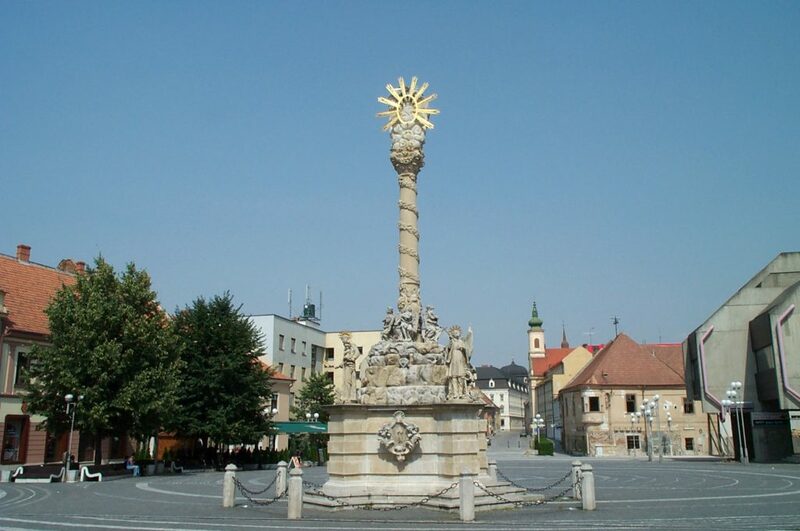 Indeed, Trnava has all the elements that make for a wonderful tourist attraction — loads of monuments, a huge downtown with lots of shopping and eating, and tons of antiquities. However, I happened to visit it on the end of a Sunday, so actually I encountered very few people. I have since been told that’s unusual — so these photos from 2001 don’t necessarily represent the city now. 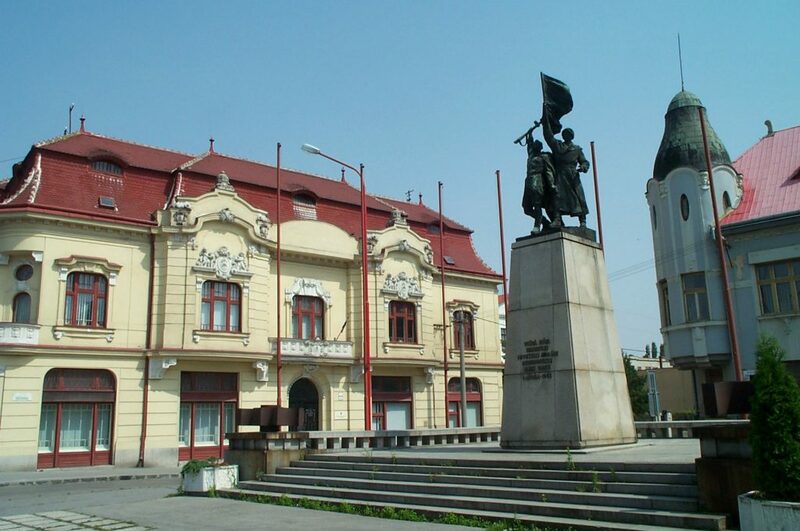 Trnava was known for its monuments, such as the World War II monument above, built among some of the town’s finest specimens of architecture. 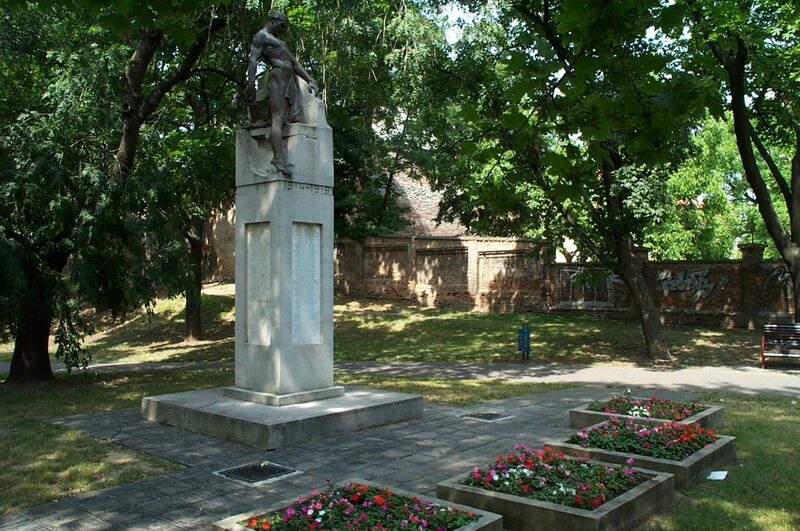 Monuments are everywhere in this city, including the below World War I monument built outside the remnants of the former city wall, extending the better part of a kilometer down the western side of downtown. The main downtown is an L-shaped pedestrian zone about five hundred meters on each side and about sixty meters wide throughout. Clearly, the town harkens back to its earlier industrial days when people traveled mostly on foot — the streets are lined with small markets and shops, as of yet unintruded with western influence. Ordinarily the city square is loaded with cafes, but again late on a Sunday it was pretty quiet. 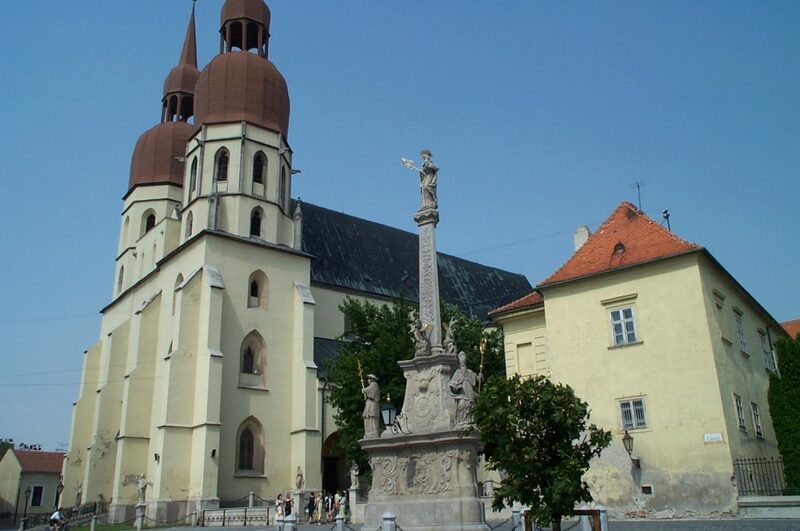 Trnava also sports a number of classic old-style churches, such as Obchodaý Dom in the final picture. I counted at least six impressive churches scattered around the downtown, each of different denominations and architectures — further demonstrating western Slovakia’s rich history. I watched what appeared to be a funeral procession (partly visible to give you a sense of how large the church is) walked across the square to reach the Dom. After I ventured the city for a bit, I saw them congregating outside, presumably with the Mass having concluded. Alas, I must admit that between Trnava and Trenčín, I preferred Trenčín but again this was a Sunday afternoon in 2001 and if you access Google Maps now you will see how much has changed in the past sixteen years. Perhaps on a return visit to Slovakia one of these years, I’ll have the chance to go back and see for myself.